Brewing chaga mushroom tea is a simple way to extract the healing compounds of this versatile mushroom, by using hot water extraction. 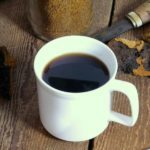 Anyone can learn how to make chaga tea, whether you’re at home, or outdoors huddled around a fire! The chaga mushroom (Inonotus obliquus) is a wild growing fungus that grows on mainly white and yellow birch trees in the Northern Hemisphere. 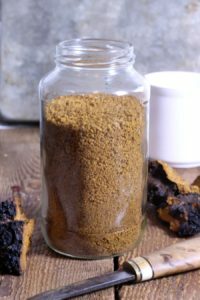 Commonly found throughout Canada, the Northern United States, China, and Russia, chaga has been used for centuries in healing teas and remedies. It can even be used as a fire starter! Why Would I Want To Drink Chaga? The information contained in this article should not be considered medical advice, and should beused for informational purposes only. Nursing or pregnant women should seek the advice of a healthcare practitioner before consuming herbal remedies. Why would anyone want to consume this funky looking fungus you may be wondering? Chaga is an ancient herbal remedy filled with various vitamins, minerals, antioxidants, and phytonutrients. Said to help treat everything from tuberculosis, bad circulation, weight-loss, and even to help in the treatment of some cancers due to it’s extreme to betulinic acid content. It is easy to see why chaga is the go to natural tea if you are interested in trying a natural health product. 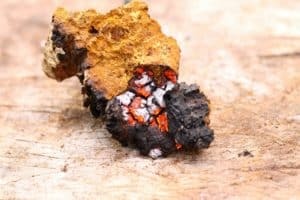 How effective chaga is at actually curing these diseases is hard to say as there has been very little research into it’s effects. The potency of the chaga tea or tincture itself would also play a role in how effective a remedy it would be. If you plan on using chaga for medical purposes, always consult a healthcare practitioner first. Regardless of if chaga is the ‘miracle mushroom’ it is claimed to be , it is full of beneficial minerals, vitamins, and nutrients, so making chaga tea at home it can’t be a bad thing! Where Can I Find / Buy Chaga? As mentioned above, chaga can be found growing wild in the forests of North America, Russia, and Europe, and was prized by native cultures for its varied medicinal uses. A parasitic fungus that will eventually kill the host tree, chaga will produce a sterile bulbous black tumour or cankor on the outside of the tree. The fertile (or fruiting) part of the fungus is almost never visible and grows underneath the bark of the tree once the tree (and the fungus along with it) dies. Look for chaga growing on mature yellow, and silver birch. Similar looking fungi grow on other species of trees but are not true chaga, and as such should not be foraged and consumed. While anyone start harvesting chaga for themselves regardless of the season, it’s easiest to forage for chaga in winter, when there are no leaves to obscure your view of the trees. The tell-tale black mushroom is also much more visible against the white backdrop of winter, then during other seasons. Once you find a tree with a large chaga cankor, simply take an axe or small hatchet and carefully cut the fungus of the tree. Chaga smaller then your fist should be left intact to continue growing as, the older the chaga, the more potent it’s benefits are believed to be. As a parasitic fungus, chaga will live along with the tree, for the duration of it’s life cycle. While the fungus will eventually topple and kill the tree, if the tree isn’t harmed in anyway, both can live in unison for 20 to 30 years before dying. Always make sure to harvest chaga from living birch trees, as the fungus will die along with the tree once it dies and begin to rot. If you don’t want to forage for your own chaga, dried ready to use chaga can be purchased from various online retailers, though I would highly recommend using a reputable chaga supplier such as Annanda Chaga. If purchasing chaga, this step is not required and the chaga will be ready for consumption immediately. If you did forage your own chaga though, you will need to clean and prepare it for use. Start by quickly washing the fungus to remove any dirt or insects that may be hiding in the little crevices. Shake off all the water and break the chaga into fist sized chunks. Lay the chaga out in a shaded area and let it dry for two or three days. Once it has had a chance to air dry, bring the chaga indoors and let it continue to dry in a dark cool spot such as your basement or pantry. Let the chaga dry in a dark cool location until completely dry, brittle, and light. This should take about a month. Once the Chaga is fully dried, process the chaga into varying sizes. Chunked (1 inch size pieces) for use in steeped large batch or slow cooker teas. Coarsly Ground for use in a french press, bodum coffee maker, or tea ball/bags. Finely Ground for use in teas, direct addition to soups, stews, smoothies etc. Store the chaga in airtight containers such as mason jars or vacuum sealed bags for long term storage. Brewing chaga tea at home couldn’t be easier. Regardless of which method you choose to follow, the key is low and slow. 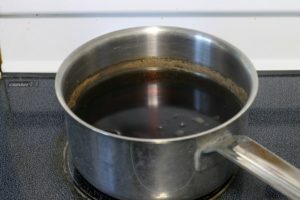 Especially if you are looking to extract as much of the medicinal properties as possible, it’s important not to boil the tea, and instead simmer it (80C or 176F) for a minimum of 15 minutes. The nutrients inside of chaga are protected by an extremely durable material called chitin. Because of this chaga tea needs to be brewed for extended periods of time, much longer then regular teas to unlock all it’s health benefits. The larger the chunks of chaga used the longer the tea needs to be brewed. 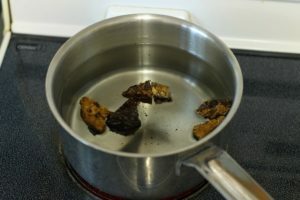 If brewing chaga tea on the stove top using a pot, it’s best to use larger chunked chaga and not a fine grind, as you can more easily remove the solid pieces prior to drinking the tea. The upside to using larger chunks is that you can re-use the chaga until the tea no longer becomes a dark brown color. Simply pop used chunks of chaga into a small baggy, and pop them in the freezer. Use from frozen to re-use. 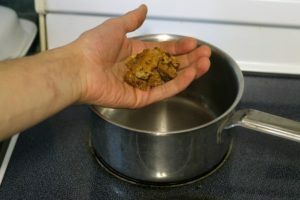 Select 4 to 5 individual chaga chunks to add to a pot filled with 4 cups (1 litre) of water. Slowly bring the pot to a simmer, and simmer the tea for a minimum of 15 minutes. If brewing large batches of tea, simmer the pot for 2 to 3 hours. Strain the chaga chunks from the tea, and serve the tea hot immediately. It may be sweetened with honey, maple syrup,. Even milk can be added to the chaga tea to substitute your morning coffee. Refrigerate any leftover tea and use within 7 days. The tea may be drank cold (iced) or re-heated. You can alternatively brew single cups or small pots of chaga tea by using a finer ‘grind’ of chaga. Add 2 to 3 teaspoons of ground chaga powder per 1 cup (8oz) of water to a tea bag/ball or bodum style tea pot. Boil the water, and pour directly over the ground chaga, and into the cup or pot. Steep for 10 to 15 minutes, then remove the tea bag/ball, or steeper, and serve the tea hot. The tea may be sweetened with honey, maple syrup,. Even milk can be added to the chaga tea to substitute your morning coffee. What Does Chaga Tea Taste Like? 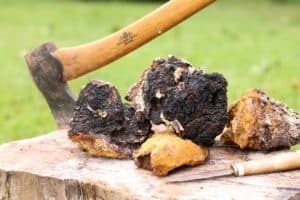 A lot of folks may assume incorrectly that since chaga is such a dark, and durable fungus, that it’s tea would taste quite strong, bitter, and unpleasent as many natural herbal remedies can be. This is incorrect though, and a good quality chaga tea is actually quite mild, slightly sweet, and even somewhat fruity in flavor. 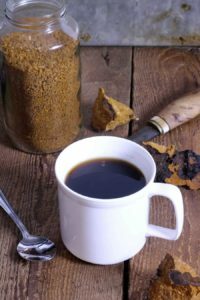 If your chaga tea tastes very bitter, ‘dirty’ or just plain gross, it is most likely contaminated with mold, of poor quality and should not be further consumed. 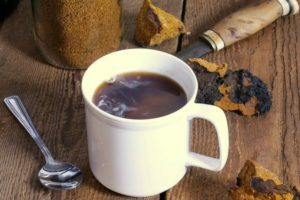 Learn how to make chaga tea at home, with this guide covering everything from foraging to brewing. Chaga tea makes a great healthy alternative to coffee! Keyword chaga mushroom tea, how long will chaga tea last?, what are the benefits of chaga tea?, what does chaga taste like?, what is chaga? (Optional): If making a small batch of tea use 3 - 4 tsp of ground chaga powder in a tea ball or steeper, in an individual mug or bodum style tea pot. One other extremely useful way chaga can be used is as a fire starter or to transport fire on a hike or backwoods excursion. When dry, chaga is very dry and porous. This makes it ideal for use as a fire starter, as chaga has a tendency to smolder very slowly, and wont actually burn with a flame. To use chaga as a fire starter, grind dried chaga and use it as you would dry tinder with a steel fire striker. To transport an ember, hold the dried chaga to a flame until it starts to smoke and smolder. Wrap the ember in leather then store the chaga ember in a cloth bag. Once ready to use, take out the chaga, and blow on the ember to bring it back to a glowing red. Hold dry grass or wood shavings to the ember to catch a flame. Another use for chaga us as smudge. In other words, dried chaga can be lit, and left to smolder and smoke much like incense is. The sweet smelling smoke is excellent for keeping flies at bay! Hi, can I ask on what type of surface or container should I light the dried chaga chunks? Hi Cristina, It doesn’t really matter what type of surface you light the dried chaga on as long as it is fire proof. I love chaga tea! I never knew that it could be used as mosquito repellant though!! How interesting.